If DST doesn’t effectively realize household energy savings, then how can we explain its perpetuity as a policy, at least in the U.S.? World War I: The administration of President Woodrow Wilson implements DST for the first time in U.S. history to reduce pressure on the electricity grid and therefore accrue reserves of coal for wartime use. The policy was retracted at the conclusion of the war. 1966: The U.S. Department of Transportation is charged with enforcing the Uniform Time Act, which provides for a uniform DST cycle in the United States from the last Sunday in April to the last Sunday in October. 1973: The oil embargo prompts the Emergency Daylight Saving Time Energy Conservation, legislating for year-round DST over a period of 15 months. 1986: Amendments to the 1966 act extend the DST period by moving the start date to the first Sunday in April. 2005: The Energy Policy Act of 2005 further extends the DST period, implementing a start date of the second Sunday in March and an end date of the first Sunday in November. This legislation charges the Department of Energy (DOE) with conducting extensive research by 2007 to vet the energy savings realized by extended DST. DST around the world: blue: practices DST; orange: used to practice DST; red: has never practiced DST. The kicker? The DOE has yet to complete this research. So how does the U.S. government justify this long history of fortifying DST policy? Engineer John Lowe of the National Institute of Standards and Technology attributes the policy to anything but science in an interview for the Christian Science Monitor: “Maybe the strongest arguments are convenience and tradition.” My mom, for one, routinely questioned the shorter DST cycles that ended before Halloween, making for spookier trick-or-treating conditions during my childhood. But I think she was hopelessly optimistic—most kids wait for dark, regardless of the time, to begin their candy crusades. With brains fried: why DST? Fellow Stanfordians and Californians: rest assured that the nexus of DST and economics persists outside of our sunny state. Michael Downing, the author of Spring Forward: The Annual Madness of DST (2006), was visiting a San Francisco Zen center at the age of 45 when a light-bulb lit up in his head: why do we practice DST? Mr. Downing cites two “benefits” of DST: “it costs nothing to implement and consumers do not have to conserve energy.” But DST policy is nowhere near free; rather, it externalizes costs by encouraging consumers to spend, spend, spend. DST, empirically a “retail-spending plan,” boosts earnings for the golf, barbecue, Halloween candy, gasoline, and convenience store industries, as Americans engage in material pastimes rather than simply head outside. Whatever happened to reduce, reduce, reduce? As of 2008, the residential sector accounted for 22% of U.S. energy consumption, second to industrial consumption (31%). U.S. electricity consumption totaled an astronomic 3,873 billion kilowatt-hours (kWh) during the summer of 2008 alone. The residential sector accounted for 1,379 billion kWh, or 35% of total electricity use. The U.S. Energy Information Administration (EIA) reports that the average U.S. household consumed 11,040 kWh during 2008, producing 16,336 pounds of CO2 emissions. A single household’s yearly electricity consumption produces the same emissions as almost two passenger cars or 360 cylinders of propane for barbecuing. The EIA calculates that lighting accounted for 215 billion kWh, or 15% of residential energy consumption, in 2007. This value fluctuates on a yearly basis between 9% and 15%. We could justifiably raise questions about the legitimacy of DST based on its focus on the residential sector rather than on the industrial and commercial sectors, but the EIA reported a 7.6% increase in sales of residential electricity during the first three months of 2010 and projects a 7% increase in sales during the coming summer months. With this prediction in mind, let’s continue to focus on the household to learn more about the effects of our everyday practices. University of California, Santa Barbara Professor Matthew J. Kotchen, writing on behalf of the National Bureau of Economic Research, presents a strong case against the correlation between DST and energy savings, based on his findings from a case study conducted in Indiana between 2004 and 2006. Prior to 2006 legislation, a road trip through Indiana may have been a waking nightmare, with individual counties determining whether or not to practice DST (incidentally, ideal conditions for a comparative experiment). Kotchen’s observations of 250,000 households produced the following results: yearly increases of 61.01 kWh per average household and 166,217,000 total kWh for the state of Indiana. With electricity costing an average of $0.054 per kWh, the additional consumption cost the state of Indiana more than $8,963,371 per year, money that could have been invested by individual households for energy-efficient appliances. Saving some green to be green: yet another reason to introduce the kids to the great outdoors right outside the front door! Let’s entertain one more thought: maybe the problem is the framework rather than the policy, itself. The CEC May 2001 report propounds DST policy “so that the solar day corresponds more closely to our activities.” But rather than abide by energy-inefficient policy that arbitrarily legislates for daybreak and nightfall, I would call for grassroots action—tempering our habits as energy users and consumers and adapting to natural cycles with the health of the Earth in mind. 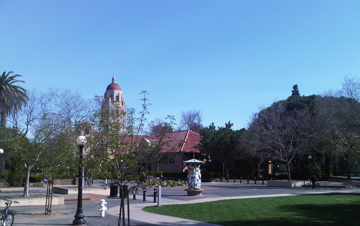 Sequestering sunlight on White Plaza in Stanford, California. “I love summer sunlight, I just don’t like this [DST] as a measure to save energy,” says Downing, who shines light on Congress’ tradition of wielding DST in the absence of meaningful energy legislation and in the interest of satisfying business lobbies. But the policy focus on the energy consumption of individual households flatters us: WE have the power to create more harmony between our activities and the natural cycles of the Earth and Sun with healthy (and fun!) lifestyle changes and adjustments to our household appliances. The U.S. Energy Information Administration for statistics on energy consumption. The Environmental Protection Agency Green Power Equivalency Calculator to learn about the potential energy savings of converting traditional forms of power to Earth-friendly ones. The Environmental Protection Agency Greenhouse Gas Equivalencies Calculator to learn about your electricity-related carbon footprint. By switching off the lights, cutting shower time and use of heating and cooling, and upgrading to Energy Star appliances, we can wean ourselves off of electricity and dramatically reduce our carbon and ecological footprints. Check out this primer from the National Energy Education Development Project to brush up on the individual components of your household energy consumption. And remember that at the end of the day (longer or shorter), there’s us—adults, college students, and kids—and the world around us, where blue skies and fresh air abound. Let’s turn DST into EST and FCT (fun-creating time) by heading outdoors, where solar power is comforting, plentiful, and best of all, free.